I do have a full time job as a Director of Music in a wonderful school, where I teach music to children from really tiny to much older. Was this always the case? Did our esteemed organists of old have to earn a decent crust by teaching in schools – or could they just lounge about practicing their Bach all day and turn up on a Sunday ready to show off their skills? One of the interesting things I’ve done recently is to do a bit of research into the fine gentlemen who held the same position as Organist at St Mary’s throughout the centuries, and I tried to find out whether as the centuries passed, the job had changed at all? You bet it has! As I see some of the images of the organists and choirmasters of old, I see a calm assurance in the photographed faces that everything is fine, and nothing that can happen is beyond their control. The gentleman with the impressive moustache in this picture is George Boutrell, who was St Mary’s Organist from 1897–1909. See how the wonderful expression on his face shows that all is well, he is surrounded by a legion of loyal choristers, for whom singing in the choir is the pinnacle of their youthful achievement. And if we go further back in time at St Mary’s, we find Robert Nunn, Organist from 1822–1863, who had a simply enormous house in Bury St Edmunds. It was so large that he was able to have public concerts in one of the rooms… that’s ONE OF THE ROOMS. It held 300 people and had an organ and a stage and he could regularly hold concerts in it. Now, that is really impressive even by today’s standards. He may have had a concert hall in his home, but his trebles often caused him trouble as apparently the boys used to collect walnuts on the way to church and throw shells at the congregation from the West gallery! However he did a good job of training these walnut-lobbers, and had a decent salary of £31-10s a year – not bad, even by today’s standards! He is buried so close to our church that he can probably hear me practicing at night! My final chap is probably the most impressive, Ralph Guest, who was Organist from 1796 – 1822. As if his long service was not enough, he also managed to write and publish a version of the ‘Psalms of Davis’ arranged for every day of the month in 1816. One of the best things you could achieve in those days was to be allowed to be buried in the Great Churchyard in Bury St Edmunds, and Ralph was afforded this honour. Maybe his choirboys were not so good at flicking walnuts in those days – perhaps they concentrated on singing well, because he was well and truly honoured after he popped his clogs. His headstone faces the opposite way to all the other gravestones, (including his wife). This honour was usually saved for the clergy (with their feet to the West), so that at the time of their resurrection they would arise facing their flock, rather than facing East. Although Ralph was not actually a member of the Clergy, possibly being the organist and choir master would qualify him for this rite. So he was laid to rest in the shadow of his beloved church. That was the highest honour that could be given to an organist and choirmaster. Now, moving on to the 21st century. How have things changed? Well, I can safely say that in my house I do not have a room big enough for a concert with 300 in the audience. We’d probably struggle to fit a string quartet in our lounge! I also doubt whether I shall be afforded the honour of a burial in the Great Churchyard. So what has changed? The previous Organist of the Parish Church would have held his head up high in local society, assured of social status and a stonkingly large house to boot. 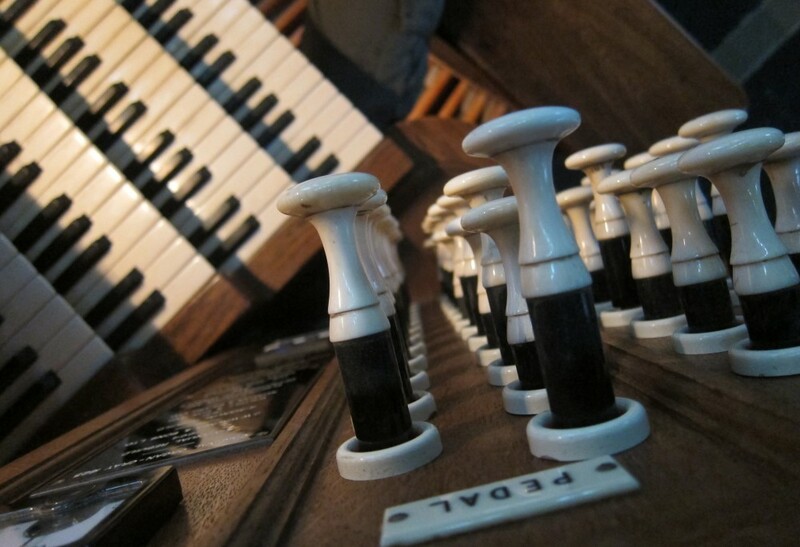 Nowadays, your humble organist is happy to tootle around on whatever organ they can find, and will accept the tuppence ha’penny that goes with the joy of weekly access to a real pipe organ. Of course, it is necessary for organists to take a ‘proper job’ in order for them to survive and provide some food and warmth for their loved ones, and surely the improvement in technology makes this so much easier?.. Well maybe – but the wonderful improvements in technology also mean that we as church organists have no respite from the problems that rise up on your iPad or iPhone during your average week. 11.07am – My message to Organ builder: “Help, Mr Organ-builder. Are you able to go in to St Mary’s and sort out the cyphering Trombone ASAP. We have a funeral later, and I don’t think it would be dignified having a loud Bb Tombone sounding throughout the service”. 11.09am – Wife: “Can you ring the bank before 12pm to sort out the problem, and also a bride rang me to say she wants you to play some Oasis on Saturday. Can you ring her between 12.30pm and 12.40pm? Could you get some chicken livers on your way home, before you have your organ pupil, and we’re right out of Dog food”. 11.10am – Office @ St M’s: “Organ builder says can you take out the pipe? He is in Malta and cannot help out”. 11.14am – Office @ School: “I’ve received a message from an organ builder wondering why he needs to get chicken livers? Can you sort this? Please remember the GCSE exam starts at 11.20am”. Write clearly and in black ink. Do any rough work for multiple-choice papers in the question booklet. Are we to attempt ALL questions as pupil organists? I love the ‘piped’ humor. Chicken livers? Sounds like she was planning a canneloni (washed down with a nice Frasquati no doubt). My Mrs has veggie pasta and all my daughter will eat is pasta and pesto it seems. I wouldn’t mind, but they are not so keen on my preference; flocci-gnocci I call it. Talk about innapropriate for a wedding, I jokingly suggested the Boellman toccata for ours just to hear the new 15 foot trumpet pipe and she called my bluff! I had to linger in the Great West door that we paid £50 to have opened just to hear it! But then Adrian, we know what the organ is for (thumbs nose), and it aint for some namby-pamby noel variations. Bring on them full ranks! !